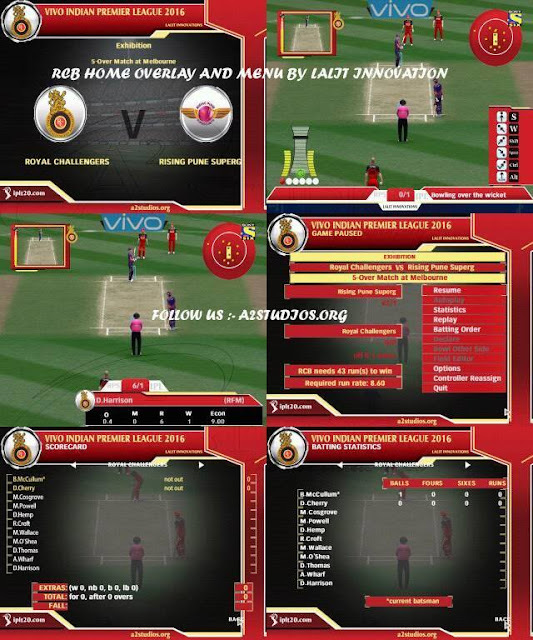 Innovational Vivo IPL 9 T20 Slog Fest 2016 Overlay Pause Menu & Scorecard Patch for EA Sports Cricket 07 Video Game now available for download free. Download now the most innovational Vivo IPL 9 T20 Slog Fest 2016 Patch Overlay ever made for EA Sports cricket. This overlay has been made look like realistic Vivo IPL 2016 Season by editing RFE File. Gorgeous. Isn't it? You would definitely love playing it! How to Install vivo IPL 9 Overlay Set? Just download the rar file from link above. Extract all the files present in rar file to your EA Sports Cricket 07 folder. Simple! ed my find this page. Is this game available on mobile? because i would love to try it. Thank you @Jack Moeller. It worked for me. Thank you @Jack Moeller. I was searching for any working version. Thank you @Jack Moeller. I really need this. Thank you a lot @Jack Moeller. Thank you @Jack Moeller. You just saved me a lot of time. Thanks Jack Moeller. Great share. It worked. Thank you @Jack Moeller. Thank you @Jack Moeller. I need this patch. Thank you for sharing it @Jack Moeller.